We offer a wide range of pediatric dental services to promote a lifetime of healthy teeth and gums for your children. Call us today to learn more about our Alpharetta Children’s Dental Treatments. Our office, as well as the American Academy of Pediatric Dentistry, recommends that your child visit the dentist by his/her 1st birthday. 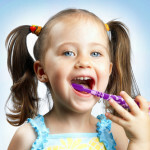 Regular cleanings are critical to your child’s development of healthy teeth and gums. We perform regular check-ups, cleanings and oral health evaluations in our Alpharetta children’s dental office. We invite you to visit our children’s dentist office in Alpharetta to learn more. At Smile Magic Dentistry, we utilize Digital X-rays, which use 90% less radiation than traditional x-rays, thus exposing your child to lower levels of radiation. Digital X-rays also provide us with immediate images to quickly diagnose hidden problems. We are pleased to offer Cosmetic or tooth-colored fillings. These types of fillings are the same color as the teeth that they are bonded to, thus making them virtually invisible in the child’s mouth. Intravenous (IV) sedation is a deep sleep that insulates your child from the stress and discomfort associated with dental procedures. It is not the same as general anesthesia used in a hospital. IV sedation dentistry is recommended for the very young child who may have a hard time sitting still for a lengthy, complex treatment. IV Sedation dentistry is also beneficial for children with special needs who may face extra difficulty in tolerating dental treatment. Additionally, IV sedation dentistry can benefit children with a strong gag reflex who cannot endure having dental professionals’ hands in their mouths. We encourage parents who feel that their children may benefit from IV sedation dentistry to discuss this option with one of our dentists. If you opt for IV sedation as part of your child’s dental treatment, be sure to discuss any precautions that you should take in advance of the appointment, such as making sure that your child does not eat or drink anything after midnight in advance of the procedure. We are pleased to offer IV Sedation Dentistry. This type of procedure is used to minimize pain and discomfort, guard patients’ safety, and control anxiety.